Music director Thaman has become a very busy man these days, with a host of big projects in hand. 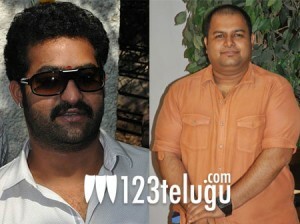 He is wrapping up his work for Young Tiger NTR’s ‘Baadshah’ and Thaman is working extra hard for this movie. He stayed up all night yesterday to finish his work in time for the team’s shoot. “Baadshah songs work all night as the team is leaving to capture spectacular visuals.. excited :)”, he tweeted. Filmnagar sources say that ‘Baadshah’ will have some pretty solid music from Thaman as he has put in a lot of efforts for this movie. Kajal Aggarwal is the heroine in this film and Sreenu Vaitla is the director. Bandla Ganesh is the producer of this summer entertainer.